I am not at all certain how to define "environmental books" at this point (I'll be dealing with that issue in the future), so for now, I'm casting my net broadly. Today I'm talking about children's gardening books, because gardening roots all of us to our environment, children and adults. 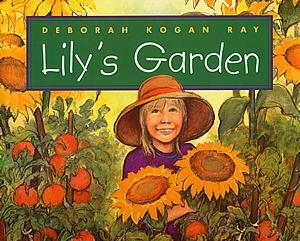 First up is Lily's Garden by Deborah Kogan Ray. In addition to her work as a children's book author and illustrator, Kogan Ray is a fine artist whose work includes landscape and nature subjects. Reviewers described Lily's Garden as a book for preschool through 3rd grade, which I think is probably correct. In addition to there being more text here than I'd expect to see for younger children, Lily is in school and and is able to manage a year's worth of gardening activities, either on her own or as part of a family. Lily's Garden portrays a child who lives within the natural year. Each two-page spread covers one calendar month. On the right page is a narrative of Lily's life planning, managing, and harvesting either her own garden or crops such as blueberries or apples. On the left is a sidebar with more information on the plants (watermelons come from Africa) or activities (harvest festivals around the world) Lily mentions. As with The Rainforest Grew All Around, which also had extras, this material can be read or not, depending on the age and interests of the child reading or being read to. Lily is part of her Maine environment, and there is a comfort aspect to this situation. There is always something for her to do. Lily's Garden is out-of-print, but well worth looking for in libraries or snagging used, if you can find it. 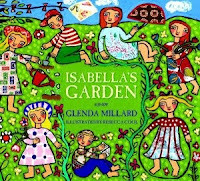 Isabella's Garden by Glenda Millard, with illustrations by Rebecca Cool, has less of a connection to the real world than Lily's Garden. The illustrations have more of a Tomie dePaola vibe, but dramatic, rather than cute, with intense primary colors. The major hook is the "This is the house that Jack built" text. all dark and deep, in Isabella's garden. This is the rain that soaks the seeds..."
This book, too, moves through a year. Shoots come up, flowers waltz in the wind, birds are hatched, leaves turn colors, "winter comes swiftly and silent and soon." Isabella's Garden is listed at Amazon as being for the same age group as Lily's Garden. It probably doesn't have the comfort of working with nature that readers can get from Lily's Garden. It is, however, a beautiful book in both word and image. Beautiful may not be a strong enough word. Perhaps I should call Isabella's Garden stunning. This could be a terrific reading experience for two generations. Are you doing an environmental book club at a library or someplace, or is the environmental book club the name for the set of blog posts? I came through from the Kid's Lit Blog Hop. In some ways the idea of "environmental books" sounds scary to me, because so much environmental news is scary. It seems like almost every book about a different type of animal or biome ends with how humans are messing things up. Yet gardening books sound safe... connecting with the environment around, but not really freaky. I did not know that watermelons come from Africa. I'm going to have to see if I can find a copy of Lily's Garden. Christy--It's the name for the set of blog posts. My plan is to make it a continuing series. I think the idea of environmental books probably isn't very attractive for a lot of people, either because of the scary elements you mention or because people like me find so many of them very heavy-handed with a message. What I've decided to look for are books that focus on providing readers with an experience, such as these gardening books. I think for kids, in particular, there's something comforting about simply experiencing a different environment for a little while, particularly if they can experience it the way creatures/people who really live there do. My theory is that that kind of exposure could do a lot to make readers feel an interest in the natural world. Cool theme! Many of our neighbors have gardens and have shared their yummy produce. Hopefully Max can learn from them because his Mommy sure has the opposite of a green thumb! Thank you for linking into the Kid Lit Blog Hop! I want to get a copy of Lily's Garden for our school library - it sounds fabulous! Thanks for sharing your recommendation in the Kid Lit Blog Hop. I found it at my local library. It appears to be out-of-print now, so I hope you're able to find it.